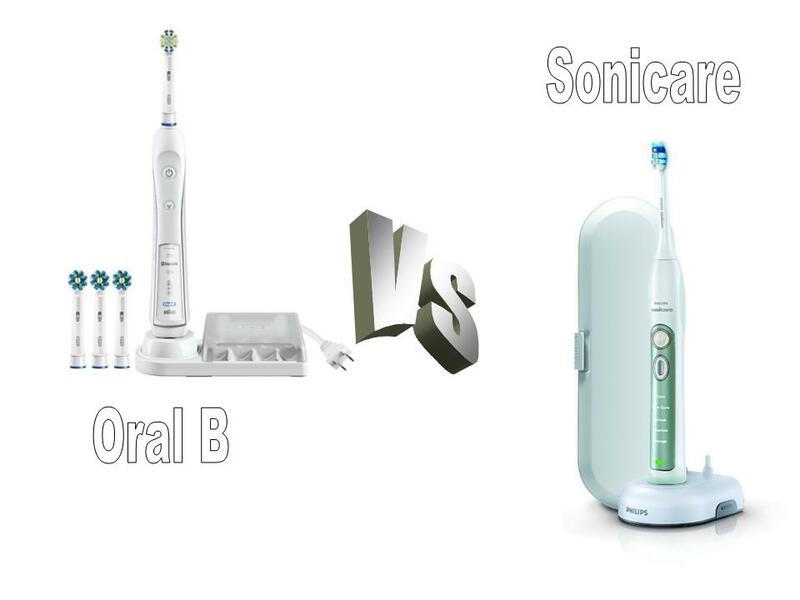 Oral B vs Sonicare Review: Which is the Best Electric Toothbrush? 5000 and Sonicare Flexcare, the two leading electric toothbrushes entered the market, vying for both shelf space in stores, and ultimately your mouth. Good oral hygiene is not only the key to having healthy teeth and gums, using an electric toothbrush is a good tool to help you prevent diseases as well. Dentists usually recommend an electric toothbrush to their patients, and this Oral B Comparison gives a side-by-side comparison of each Oral B electric toothbrush model. In this unbiased electric toothbrush review, we will delve past the hype and marketing, and compare features, functions, capability and benefits of each of popular electric toothbrush to help you decide on Oral B vs Sonicare, which is the best electric toothbrush for you and your family’s dental hygiene needs? Sonic Toothbrush or Oscillating-Rotating Toothbrush, Which is Better? Your two choices for an electric toothbrush is either a Sonic Toothbrush or Oscillating-Rotating Toothbrush. The Sonicare Flexcare electric toothbrush is a sonic toothbrush. This type of electric toothbrush vibrates at a very high rate and sweeps from side to side to remove food, plaque and tartar from your teeth and gums. As you brush your teeth, the vibrating head helps to remove more plaque and food particles than you can do with a manual toothbrush, and you protect the veneer on your teeth. 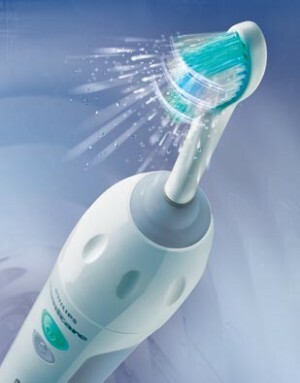 5000 is an Oscillating-Rotating electric toothbrush from Oral B with a head that spins first in a clock-wise rotating manner, and then oscillates, meaning it spins in a counter-clockwise direction to clean your teeth, gums and to even get under your gum line, to remove trapped food particles that can lead to gingivitis (bleeding and swollen gums), bad breath and cavities. The head fully covers the tooth, to both remove plaque and food particles on top of the tooth, but also gets in between your teeth to remove trapped food particles, tartar and plaque. In between teeth is where many cavities begin, and the Oral B electric toothbrush is superior at removing food from these hidden crevices. Why Use an Electric Toothbrush ? Here are a few reasons why you should use an electric toothbrush, like the Oral B 5000 or Sonicare Flexcare, rather than a manual toothbrush. With a manual toothbrush people tend to brush their teeth too hard, don’t brush properly or don’t brush their teeth for the recommended two minutes. Brushing too hard with a manual toothbrush can brush away the veneer, that is critical to protect your teeth from cavities and keeping them shiny white, and once the veneer is gone, it doesn’t come back. You can brush away gum, if you brush too hard. Over time you will have less gum keeping your teeth in your mouth, cold or hot food can more easily irritate the root and nerves causing pain. Gaps between your teeth can allow bacteria to enter your body through your mouth, leading to other health problems. Once the veneer or gum has been brushed away it is gone for good. An electric toothbrush senses when you are brushing too hard, and prompts you to use less force and pressure. Dentists report most people only brush their teeth for 30 seconds to one minute with a manual toothbrush, and electric toothbrushes have a time to ensure you brush for 2 minutes. 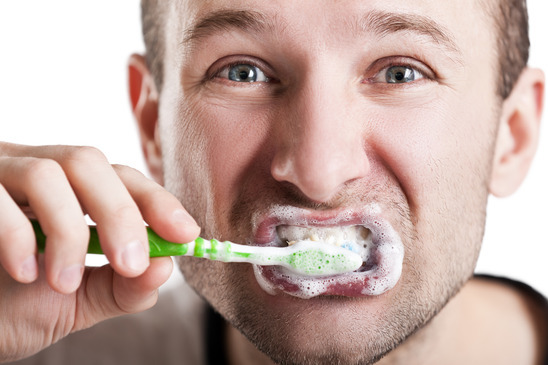 Improper brushing allows germs and bacteria to grow in your mouth, which can lead to a build up of tartar, plaque and bacteria on your teeth and gums, and can result in gingivitis,cavities, bad breath and tooth loss. Why Good Oral Health can Save your Life? Dr. Mercola, a leading natural health care advocate reported that poor oral hygiene can lead to a 70% increase in the chances of developing heart disease. Good oral health even prevent other health related issues, such as Type 2 Diabetes and possibly even Alzheimer’s Disease. This is the result of harmful bacteria in the mouth that can enter the blood stream through tiny gaps between teeth and gums, or bleeding gums from gingivitis or brushing too hard. 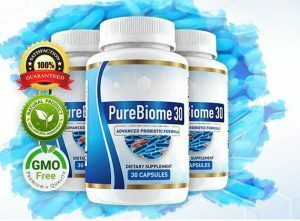 Once in your body, the bacteria settles on the walls of your arteries, and can lead to plaque build up can eventually cause heart disease or diabetes. Studies have shown that using an electric toothbrush for two minutes is far superior to using a manual toothbrush, since an electric toothbrush is more gentle on your teeth and gums, and the timer ensures you are brushing for two minutes. 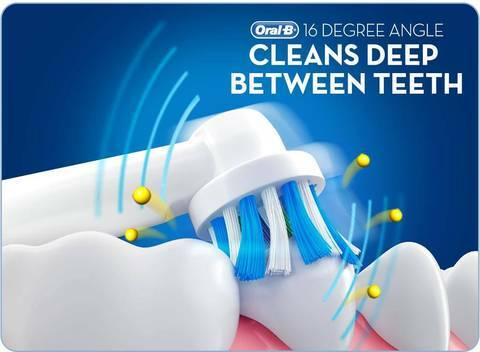 The Oral B 5000 and Sonicare Flexcare have sensors that detect and warn you that you are brushing too hard. If your dentist complains that you are brushing your teeth too hard, and you’re trying to remember to brush softer, or to angle your manual toothbrush differently is too complicated, then you definitely should look at replacing your outdated manual toothbrush with a dentist recommended electric toothbrush. 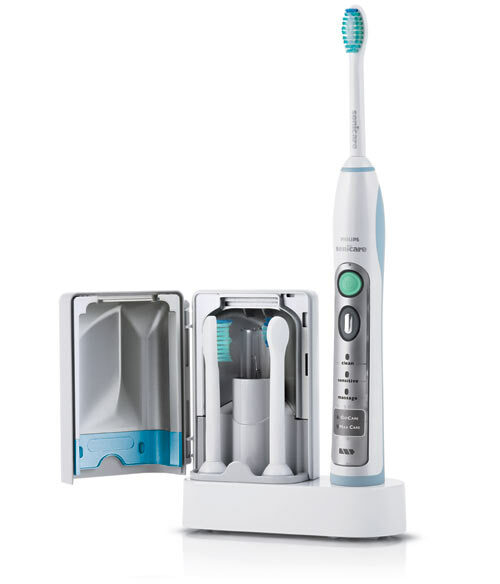 The Sonicare Flexcare Electric Toothbrush, which is available at Amazon.com is the #1 recommended rechargeable electric toothbrush by dentists, hygienists and dental professionals. Featuring a new innovative technology, the Sonicare Flexcare removes more plaque more easily than the Oral B Triumph and even the Sonicare Elite Electric Toothbrush. 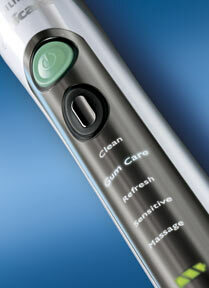 The integrated ultraviolet (UV) Sanitizer removes up to 99 percent of bacteria* on your toothbrush. This is an important health fact, since bacteria not only leads to cavities and gingivitis, but can enter the bloodstream through bleeding gums and lead other serious health related issues. The 2-minute timer helps ensure you ensure good oral hygiene with the dentist-recommended 2 minute brushing time, since most people spend 20 – 30 seconds on average brushing teeth. To ensure best performance of your Sonicare Flexcare, this electric toothbrush monitors battery life and signals when to recharge. Compact charger saves space in luggage, so you can enjoy your FlexCare toothbrush while traveling. Improvements include a 30 percent smaller and lighter design and an 80 percent reduction in vibration (compared to Sonicare Elite). Rouitine 2 – GoCare – for a quick 1-minute clean between regular brushings to remove build up of plaque and particles in teeth. The new ProResults toothbrush head moves in broad sweeping motions with contour fit bristles to help increase tooth cleaning coverage to properly remove plaque and bacteria. The Philips Sonicare Flexcare toothbrush creates a high speed bristle motion that allows a powerful, but gentle dynamic cleaning action, ensuring a deep clean between teeth and along the gum line. While many electric toothbrushes today offer a paltry 90 day warranty, Sonicare offers a 2-year Limited Warranty for the Sonicare electric toothbrush . For optimal results, replace your electric tooth brush head at least every three months. The Oral B 5000 has remained the most popular electric toothbrush from Oral B, and is recommended by many dentists, since the cleaning action is similar to the cleaning tool used by dentists.. The Oral-B 5000 is the #1 dentist-recommended electric toothbrush brand by most dentsists. The Deep Clean mode removes up to 99.7% of plaque from hard to reach areas, with 40,000 pulsations and 8,800 oscillations per minute. The Oral B 5000 prevents Periodontal Disease and gum disease, which can lead to other health issues if not addressed. You get 5 cleaning modes: Daily Clean, Sensitive, Whitening, Massage, and Deep Clean. 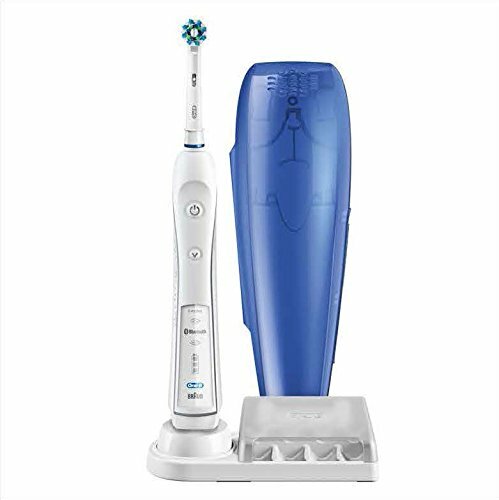 The Oral B 5000 includes a professional two-minute timer with 30-second intervals that helps guide you through the four quadrants of your mouth, making it easy to track how long you’ve been brushing. The timer also works as a digital alarm clock. Separate, wireless SmartGuide helps maximize brushing performance. Gentle on teeth and gums, due to Pressure sensor, which stops pulsations when brushing too hard to prevent injury to gums or removal of tooth enamel. Outstanding whitening and polishing in 3 weeks. Floss action technology for superior overall clean. Contains charger base with battery level, which is also your travel base. With normal daily use, the battery is estimated to last 2 weeks between charges. This may be different if you brush your teeth multiple times per day. The Oral B 5000 comes with a limited 2-year Warranty. For optimal results, replace your electric tooth brush head at least every three months. The Oral B 5000 and Sonicare Flexcare are the two most popular electric toothbrushes on the market today. There are unique similarities and differences between these two popular oral care devices. The real difference is whether you prefer a sonic toothbrush or a rotating/oscillating electric toothbrush for your oral care. If you found this electric toothbrush review of the Oral B vs Sonicare electric toohbrushes helpful, please leave a question or comment with your feedback at the bottom of the review, as we respond to all comments and questions. 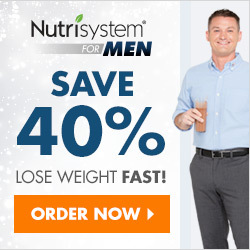 « Does an Erectile Dysfunction Pump Really Work? Thanks for the link to this article. I can definitely use it for an article. The place to find the best electric toothbrush deals. Thanks for the nice comment about my Oral B vs Sonicare Electric Toothbrush Review. Nice review. I have a Philips Sonicare. I know that the toothbrush should stop when too much pressure is applied, but it just seems that my toothbrush is too sensitive in this regard. I feel that I am only tickling the teeth, and the slightest pressure causes the toothbrush to stop. I think there might be something wrong with my toothbrush. Is there some way of assessing how much pressure should be applied in order to cause the toothbrush to stop? I have tried pressing it on some simple digital kitchen scales but I can’t tell if the brushing has stopped as the motor keeps going! Some good points here, since many kids do not brush their teeth very well, and end up with many cavities. Hi Amy, thanks for the message. An electric toothbrush is great for people who juice, since the acid content in the juice is higher for fresh squeezed juice. This acid can eat through the enamel on your teeth if you don’t brush regularly. An Oral B or Sonicare electric toothbrush will also alert you if you brush too hard, which is my problem.